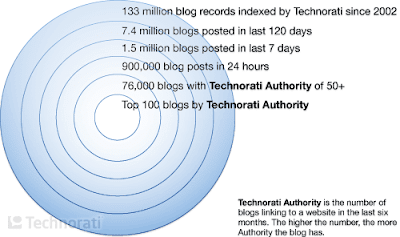 Technorati have published their ‘State Of The Blogosphere’ survey for 2008. The survey is based on responses from a random sample taken from more than 1.2 million bloggers, supplemented with traditional analysis of Technorati’s index data. There are some revealing statistics and interesting information – from demographic profiles to the motivations and style of blogging. Excerpts from the report are posted below and there is a link to the full Technorati State Of The Blogosphere 2008 survey at the foot of this page. - Google Analytics is used by 2/3 of bloggers, Sitemeter and Statcounter are used by 20% of bloggers with 42% of bloggers using more than one service for tracking. - And one of the best indicators of the growth of social media as a media / PR discipline is that one-third of bloggers have been approached to be brand advocates.